Just when I thought the micro home/green living movement couldn’t get any more creative and funky, I find this concept: homes made from old cabooses and railway cars. My mind whirled with the possibilities. Can you imagine? It’s like “The Boxcar Children”, but for grownups! Anyway, how cool is this idea? If you’re anything like me, your first question is probably, how much do these things cost? As usual, it varies greatly depending on the condition, age of the car, and historical value. For instance, while researching for this article I saw rusty cabooses that need some work for around $8,000. If you scroll down a bit and look at the dining car picture on the right (from Ozark Mountain Rail Car), that baby is going for $45,000. So, there’s a pretty wide range. The bigger question should be, how much does it cost to move these things? After all, most of these cabooses and rail cars weigh 25+ tons each. So, it’s no small feat to get them to your land. Getting the land prepped and the move logistics for a caboose or rail car is a major undertaking. One of the best resources I found online is from Jim Zon, who restored a 1921 Algoma Central Railroad Caboose in Colfax, WI. Jim has an excellent blog where he details the entire process. The section on his work prepping the land and the rails the caboose sits on is especially illuminating, and his pictures from the restoration are worth a thousand words. It’s also important to note that once you get the caboose or railcar to your site, you’re still going to have to hire a crane to set it on a small set of rails. I’ve never hired a crane, but I know they run anywhere from $300 to $1,000 per hour, depending on how far the crane has to travel to get to your site. Big time yikes. The thought of paying someone, anyone, $300 to $1,000 for anything makes my frugal blood run cold. Well, I might do it if they guaranteed to eradicate all non-military Hummers from the face of the earth. But, not for much else. So anyway, that’s a major expense that can’t be overlooked. Another major consideration to living in a caboose is zoning issues. This great article from Time Magazine tells the story of one man in Miami who had to fight tooth and nail to keep the caboose in his backyard. After a lengthy fight with the city’s zoning board, he lost. So the lesson here is that if you don’t live out in the country, you’ll save yourself a ton of headaches by getting written permission (keyword: written) to put the caboose on your lot. Well, I’m no expert but I honestly don’t see why they couldn’t be renovated with energy efficiency in mind. I couldn’t find many resources online about people who have transformed their caboose to be green, but it seems that the whole “living in a caboose” movement is somewhat new. There isn’t a lot of info out there from people actually doing this, much less doing it green. I did find one site about a man who transformed his caboose into a small home and is using solar power to run it. You can see the site here. So, let’s ponder this a moment. Rail cars are incredibly small, which means you wouldn’t need a lot of energy. Most of the interior pictures I saw online showed very small woodburning stoves as the main heating unit. Solar panels could go on the roof, a composting toilet in the bathroom, a greywater recycling system under the car itself…I can see the Green Caboose unfolding in my mind already. Fabulous. I’m wondering, though, about insulation on these. From what I saw on Jim’s blog, it seems as if the older cabooses have wooden lathe siding which is covered up by the exterior steel panels. The newer rail cars might be better insulated, but I wonder how you’d insulate the older ones? Cabooses4Sale.com– Want to buy a caboose for yourself? Make this site your first stop. 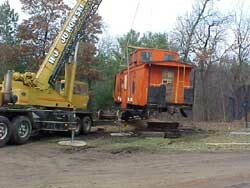 KiskiJunction.com– Great pictures here of a caboose home owned by a couple in Pennsylvania. 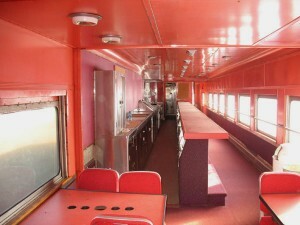 Dining Car for sale at Ozark Mountain Rail Car. TrainSale.com– This site has auctions on railway cars when they become available for sale. RailMerchants.net– Another site with lots of cabooses for sale. OzarkMountainRailCar.com– This site has a huge assortment of cabooses and railway cars for sale. RailSwap.org– Free classifieds for railway and cabooses for sale across the country. 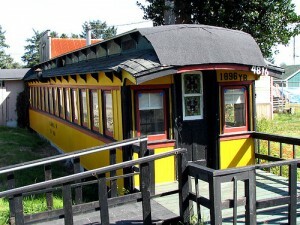 Caboose Home For Sale in Fayetteville, NC– This caboose is one I found on Craigslist. It’s completely renovated and ready to go, for $30,000. Listed on 2/16/09. The idea of living in a caboose is a fascinating one for me. I’ve still got my heart set on living in a shipping container (which is much, much cheaper), but railway cars do have psychological pull on the imagination that can’t be denied. They’re definitely unique, but require much more work than I originally thought about when starting to research this article. A lot of work, sure, but I can see the possibilities in my head and boy, you could really turn one of these into a super cool, eco-friendly living space. Innovative housing is cool, cool, cool! (I know, ‘cuz I’m a cool guy!) LOL! A “shipping crate” is a box made outta wood or cardboard. A “Shipping Container” is a Corten Steel hulk of a house box, that will withstand anything that you, your neighbors, the local authorities, or even Mother Nature can hurl at it! This really struck me because my mother put a boxcar on her land in the mid-80s and lived in it for several years while she was building her house (also a unique design). She thought of herself as going back to the basics of her childhood. We are in the South, so she thought long and hard about the houses she’d lived in before A/C and which layouts/construction types were the coolest then. And, she wanted a place to grow mushrooms as well as have a more ‘normal’ garden. She ended up with a very unique house and the boxcar became a very nice storage building. Desperately poor people in Mexico live in boxcars. You can see them squatting in the things when you take the train that goes south out of Nogales. Having grown up in the Third World, I have a hard time viewing this as a good development for Americans. IMHO, it’s just another of hundreds of indications that “globalization” means “Third-Worldization” for the U.S. If you consider all the products that go into building a home, using an already created railroad car is definitely green. Especially if the alternative is that old railroad car rusting away somewhere. Cute idea for train buffs! I live in a house made out of 2 train cars bolted together. Everything was taken off the bottom (no wheels) and I even have a dugout basement. Train cars are not very big so people before us built an addition and then we built another addition. From the outside you can not tell my house was made out of train cars. I guess this was a pretty common thing 60 to 70 years ago, but I can’t say for sure. You might think about bolting 2 shipping containers together for a little more space, just don’t forget to cut out a door between them. I heard that you can buy a sort of substainable living condo-train and travel on the railroads for a certain cost per mile; however I cannot find any information about it on the Web. Do you anything about this? In Terre Haute, IN. Thanks! My grandpa and grandma were given a boxcar in the early 50’s when my Grandpa Harry Real retired from the railroad. They pulled it onto a piece of property in Sterling, IL fixed it up and lived in it with my mother until she married in 59. My grandfather died in 66 and my grandmother lived in it alone until she passed in 1976. It still stands today and people still live in it. The way they seperated it and put built in through was ingenious. My dad added an indoor toilet/tub in 1957. Before that it was the outhouse for them. I would love to buy it back and have it listed in the local historical society. I still can’t believe they just gave it to him. They are nostalgic and should be preserved. Caboose as a seasonal cabin is ok. As year-round place is crazy! They are poorly insulated. You are better off purchasing a pre-fab cabin (of the same footprint) that is built to today’s GREEN energy efficient standards. It would be cheaper in the long-run. Use the caboose as a garden shed or some kind of seasonal structure. UR asking for trouble otherwise. Oh man I really wanna find intermodal contains!!! Agh I’ve hopped out of Nogales!!! Haha I live Mexico!! We have 4 CP cabooses for sale. They are currently located in the Edmonton, Alberta Canada area. They’re sitting on track with easy acess to the main line. I have a camp car that has been fully renovated. Master bedroom, bathroom with shower, kitchen, heating, front dining area, extra double futon, and office area. It’s located in Upper New York State. It has all the furniture & appliances along with TV in dining area. We have it listed with 2 brokers. If you are interested, e-mail me back. know about taking the caboose off its trucks and placing it on some sort of foundation? I’m trying to picture how this could be done. An innovation of human mind to do somewhat different with home. I guess would be a big hit if real estate companies come up with some funny idea with Railways. Further to my previous post, I hired Ozark Rail Logistics to make arrangements to move caboose from Michigan to western Canada. They demanded $1200 payment in advance to inspect caboose and claimed they would send me the report quickly. After 2 months I still don’t have the report. They made excuses that husband was in hospital and mother died. Then they wanted $32K in advance to ship caboose. Due to thier poor preformance I don’t recomend doing business with them unless you protect yourself somehow, perhaps get advice from a lawyer. If you pay them in advance they have no incentive to complete the job. So the caboose will go to the scrap dealer and I’ll get about $5000 for it and a few souvenier window frames and light fixtures. heard first time about “Cabooses”. It looks amazing..
So…a double skinned stainless steel house extension with windows end to end, 6 double sliding doors, prewired with 2kW of flourescent lighting, a pair of 5 kW heater packs and a three phase blower. This car was a suburban electric and has a small drivers compartment we have turned into the solar/battery shed. Pity we’ll never have enough juice to run the blower, but we are extremely pleased with our purchase. It does get too hot to stay in during 100 degree days, but with all the windows open it cools rapidly in the evenings. A tiny potbelly keeps the whole thing toasty in winter. It took nearly a week to unbolt/cut out the seats, but we did find $26 in lost change and a winning $15 scratch lottery ticket. I did have a bit of trouble cutting the drain hole for the sink though……lino, 3/4″ rubber mat, 3/4″ plywood, 1/4″ rubber mat, 3/4″ steel floor then the underframe. We now have a solar shed, guest bedroom, laundry, computer room, workshop and reading room at a fraction of the price of building. Now i just need to get some steel beams cut and welded for the extended caboose style balcony and awning. I need two cabooses, one for a model train display, and one to convert into living space. I NEED PRICES ON THE CABOOSES AND AN ESTIMATE ON HOW MUCH IT WOULD COST TO MOVE THEM TO TEXAS. And which would be cheaper to move them….by truck or by rail? I am working on a show called You Live in What for HGTV. What you did with your railcar is exactly the kind of thing we are looking for. I would love to talk to you more about it. If you would, send me an e-mail at [email protected], and I will give you more details as to what we are looking for. Hi I recently built a late 1800’s wooden stockcar to scale on a 50′ tandem gooseneck trailer. So this thing moves easily. Any offers? The Boxcar Children were one of my favorite series growing up as well! This is such a neat idea- thanks for sharing!